Bedding Information: 1 King,4 Queen,4 Twins,1 set Bunkbeds, 4 Sleepers, etc. 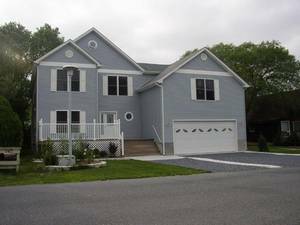 Upscale, breathtaking and well-equipped luxury resort house in Bethany Beach with 8 Bedrooms, 3 Master Bedroom Suites, 5 Baths and many amenities that you just won't find elsewhere. Charming, spacious (4, 450 sq.f), comfortable, and quiet; sleeps 26. The house is perfect for family reunions and gatherings. 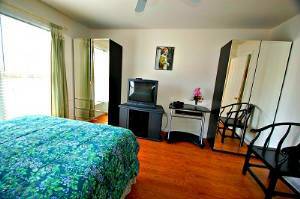 Enjoy the beach, private community tennis courts, heated swimming pools, golf. 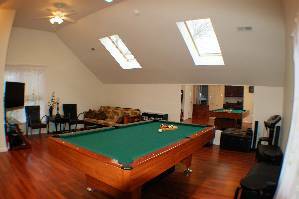 Year round entertainment also includes deluxe 8'billiard table, Ping-Pong table, and a Foosball table. The home is immaculate in every way: master bedroom suites on the first and second floors with TVs and DVDs; huge entertainment room with billiard table, full bath, bar, sofa bed; private loft that can be used as 9th bedroom, two kitchens, two washers and dryers, two refrigerators, making the residence perfect for large groups. There is huge second family/dining room with TV, DVD, futon and a sofa bed; huge sun-room with vaulted ceiling, futons, etc. 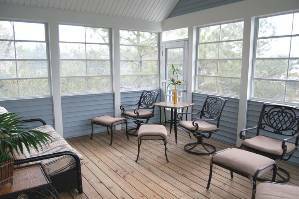 There is a screened porch with large tables and chairs. The house is fully equipped with dishes, pots, pans, glasses and silverware. Other benefits include computer, Internet, high-speed wireless Internet. 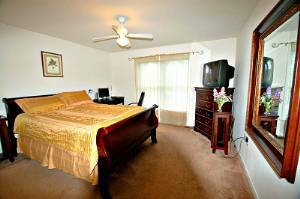 And for your end of the day relaxation the bedrooms have nice pillows, comforters and exceptionally comfortable Sealy Posturepedic mattresses that are built to provide comfortable back support. There are seven different areas in the house for family gatherings: great room, entertainment/billiard room, porch, deck, patio , den and sun room. 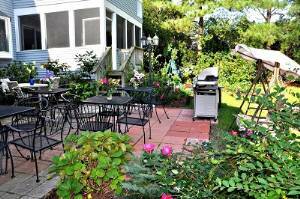 Outside living area includes patio, gas BBQ grill, swinging bench for 3, picnic tables, chairs, deck with table and chairs. Extra: ping-pong table, foossball table. 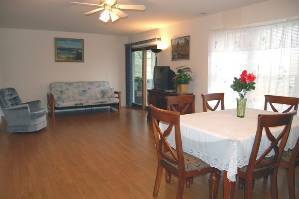 Second Floor Family Room with kitchenette, TV, futon, rocking chair, dining table,chairs. We all had a terrific week in this beautiful home. All of us were very comfortable in each bedroom and the bathrooms were lovely and very adequate for 21 of us. The game room was the hit for the tweens and the teens and even some adults. We had two wonderful karaoke nights and the ping pong matches in the garage were fantastic. We did use the white bike, biking to the the beach was magnificent and we also used the bus. We played tennis, swam in the pool and enjoyed the town of Bethany. For our group of 21, the house was perfect. Your house is beautiful. We fit six families and everything was very comfortable and well thought out. The amenities were fabulous, we loved the entertainment room (the karaoke, pool table, ping pong table, and Foosball were awesome). The house is huge, with lots of private space for everyone as well as common areas where we could all hang out and eat together. We had a couple of family dinners outside in the enclosed patio which was really nice. 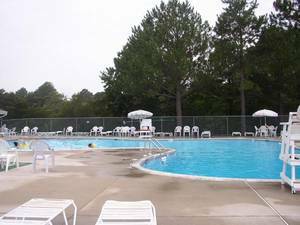 We enjoyed the swimming pools and tennis facility in the development because these facilities were never crowded. It was easy to get to the beach - definitely a vacation we will remember for a long time. We stayed here from 2/23-26/2007. This was a trip for my son's 16th birthday. The home was fantastic! When we arrived, Ina and Tony had a delicious cake for my son! The boys loved that they had their own area. They especially enjoyed the fooseball table and ping pong table. The house is huge and well stocked. We could not believe how well equiped the main kitchen was. I called my 2 sisters and suggested we book a family reunion. It would be a great place to celebrate Thanksgiving! I really liked the guest book that renters can fill out. It was neat reading about their experiences. We will definitely plan on returning at some point! We had a family reunion of 19 people staying at this property the week of July 1st, 2006. The house was lovely and spacious. We especially enjoyed the 2 screened-in porches and the outdoor shower came in handy with so many kids after a day at the beach. With that many people, finding a quiet place somewhere was still easy. We hope to visit again! We had 18 family members stay for a family reunion week. It was the best vacation ever. The spaciousness of the house kept family members from being on top of each other. The beds were very comfortable. We could find fault with nothing. My family held a reunion from 6-13 August 2005 at this wonderful house in Bethany Beach! The house is quite spacious..really two houses (floors) in one lovely package. Nice neighborhood for walking/jogging, nice walk to town/beach and fun town trolley right around the corner.